As a felting artist, I use natural fibers to create handmade, easy-to-wear garments that shield the spirit, protect the body from chill, and provide a sense of tranquility and timelessness. 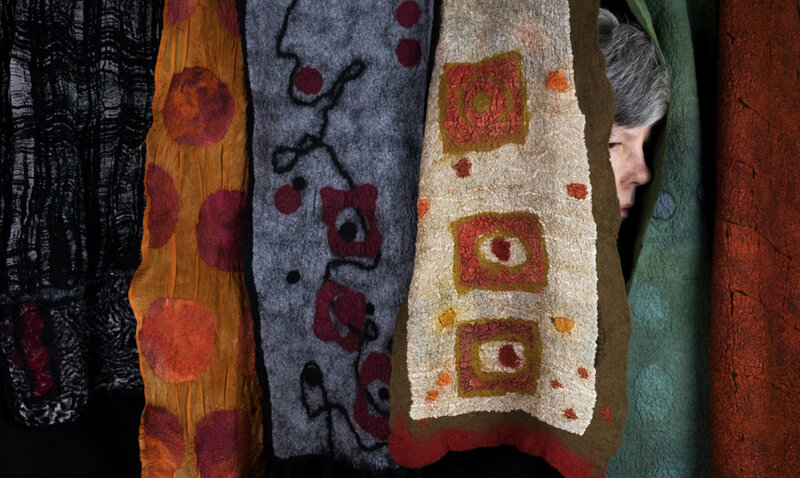 Using the felting technique called “nuno”—a Japanese word meaning “cloth”—I fuse the softest Merino wool with hand-dyed silk to create one-of-a-kind fabrics that I shape into lightweight scarves, wraps and other drapable pieces. Inspiration to begin practicing nuno felting came when I lived in New Zealand, where the ubiquitous Merino sheep provided soft, sensitive and sustainable wool. Clothing made of this organic, breathable fiber link the wearer to the world’s living beauty. Jennifer Angelo creates handmade, natural-fiber garments using the felting technique called “nuno,” or “cloth” in Japanese. Fusing the softest Merino wool with hand-dyed silk, she designs unique fabrics and shapes them into lightweight scarves, wraps and other drapable pieces that convey a sense of tranquility and timelessness. Jennifer, who holds a doctorate in occupational therapy, was teaching in New Zealand when the prominence of sheep deepened her interest in fiber arts and prompted her to experiment with wool and study felting techniques with local and international artists. Today, she enjoys analyzing the interaction of colors and the effects of organic “sumi” ink, traditionally used in East Asian cultures for calligraphy and brush painting. Jennifer is based in Madison, Wisconsin.